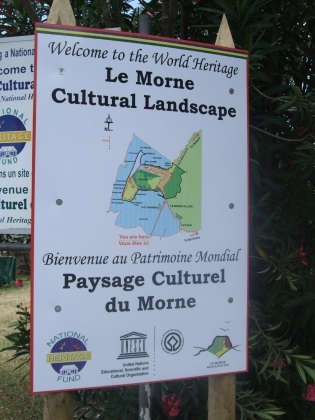 Le Morne Cultural Landscape encompasses a natural fortress that was used as a retreat for escaping slaves in the 18th and early 19th century. These escapees (the maroons) took shelter in caves and on the mountain slopes of Le Morne Brabant. Now it is a spiritual sanctuary, with high symbolic value and oral traditions about the resistance to slavery. The slaves on Mauritius came from throughout the Indian Ocean: Madagascar, Tanzania, Mozambique, India. They worked in the sugar industry. The site is described as an associative cultural landscape, for its powerful cultural associations with the natural element rather than material cultural evidence. Its visual dimension is a crucial part of its importance. Le Morne is located on a peninsula, mostly surrounded by sea. 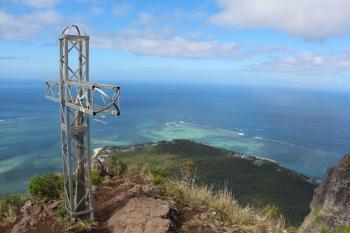 Le Morne is also known for the (untrue) legend "that slaves jumped off the mountain into death to escape from slavery". Le Morne is easy to see but hard to visit. I had my first look at it from the plane arriving from Paris. At the descent, this remarkably shaped mountain at the tip of Mauritius was very clearly visible. Its inaccessibility of course is part of its history. The steep cliffs deterred many. Mauritius even stated at the nomination of this site for WHS that the absence of cultural evidence is the ultimate proof of maroon life, as they had to be as invisible as possible. That's a daring statement for a 2034 page long nomination file! Few traces remain: six rock shelters used by maroons have been discovered on the summit, a network of trails used by the former slaves is also still there. 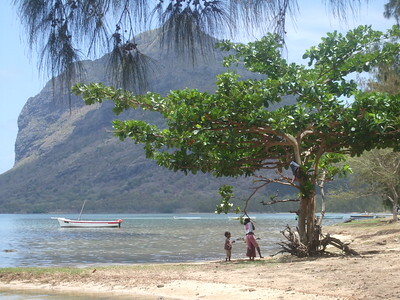 Fishing for your own meal is a common pastime too in the modern Le Morne village, like it was during slavery. But there's nothing specific to see for the casual visitor. 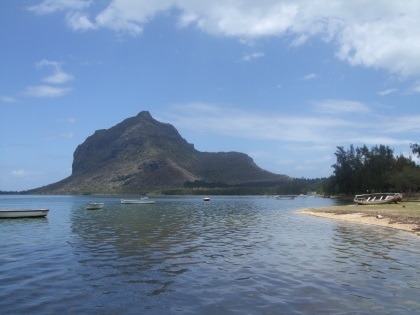 I started out on foot from Le Morne, and walked on the beach onto the thin isthmus that separates Le Morne from the Mauritian mainland. At that spot there's a sign that you enter the WHS area. Le Morne Village nowadays is a sleepy town, where people surf and fish. Like other villages in the area it is mostly inhabited by Creoles, and as such has a less Indian feel than the rest of the island. 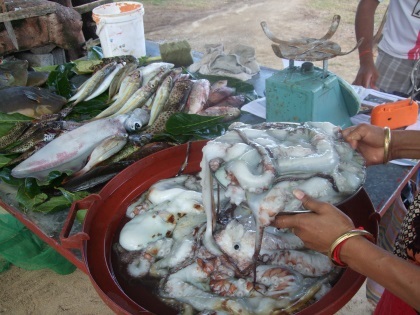 The taxi driver that had taken me there made the best out of our visit and bought two large squids and another big fish, fresh from the sea. Le Morne is easily visible from all around the area, especially the fancy hotels at the beach. To enter the core zone however you have to drive to the only entrance. It’s marked on the main road as “access to mountain”. It’s from either side a 1.5km bumpy unpaved road. The door is open from 7am to 4pm. Entrance is free. The first part is a rather easy uphill stroll. The second part is protected by an iron fence and door that can only be opened by official guides. There is no official close to the fence and climbing it seems to be a very popular option for both locals and tourists. The second part far more challenging. I would only recommend it to those who are not afraid of basic climbing. Don’t even try when it rains. The views make up for the effort and it’s a good feeling to reach the iron cross. I was not able to find anything connected to the escaped slaves living there, except maybe the trail itself, but I guess that’s hard if “not leaving traces” is part of the nomination. Me as a Swiss mountain goat did the whole trip in 2.5 hours. But I assume 4 hours is more realistic. Bring water and get up as early as possible. Especially on a Sunday it’s a popular destination. All in all a really enjoyable and picturesque WHS. Officially the peak can be visited within an organised tour (trek) through the recognised guide Yan de Maroussem of Yanature. He is the only person that has permition from land owners (the most of inscribed area is private property) to do trek to almost the top of the mountain. Almost means that you can get only to so called "V" place - some 50 meters from the top. Even up to that point the trip is quite demanding (good shoes and mountain experience required). Views from the top are really exceptional - especially those of Black River National Park. Recent price (October 2012) for 4 hours trek (usually starts at 7 a.m.) was around 40 Euro. You will feel every single euro while climbing the mountain. Le Morne is a very wonderful place to visit. The moutain with its surrounding natural landscape, the traditional village of Le Morne who welcome us warmly. I also appreciated a lot the warm reception we received at the site office of the Le Morne Heritage trust Fund where we have been told about the history of the mountain, runaway slaves who sacrificed for death over capture and the tradition of the villagers of Le Morne. For anyone who is looking for a quiet and unforgettable place, Le Morne is the ideal paradise. Famous suicides: Maroons reputedly "..flung themselves to their death off its sides rather than be recaptured"